That you can hold a phone up to music these days and identify it is amazing. But which smartphone song-finding app is more amazing? We researched and road-tested the two most popular song ID apps to see which was a better install. 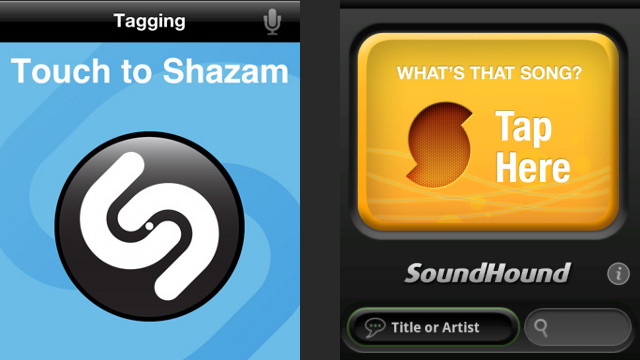 Both Shazam and SoundHound offer free song ID apps for Android and iPhone, with Shazam covering other platforms, too. Shazam's free iPhone version is limited to five song IDs, or "tags", per month, while SoundHound is an ad-supported but otherwise free service. Both show artist and song information when they can identify a song, with purchase and YouTube links and bookmark options. SoundHound has a bit more visual build-out, but Shazam has the simple, clean look down. Other than that, they both serve the same purpose: to name the songs you're currently hearing. In the case of Shazam, the exact detailed method for its song identification system is a trade secret. But the Shazam team has revealed some aspects of the system in white papers, and some have explained the basic algorithm. Put plainly, Shazam contains a vast database of songs. 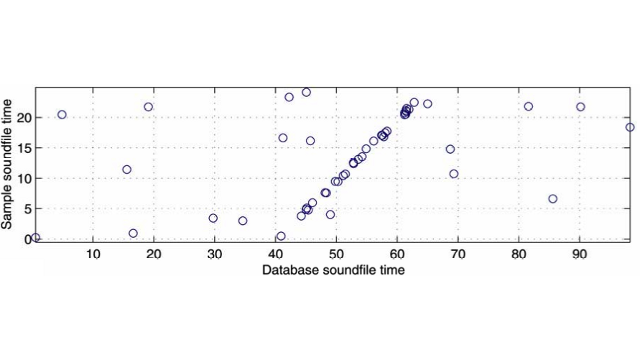 Those songs are taken apart and analysed for their acoustic properties — specifically the "peak frequencies" at various points. When you capture 10 seconds of audio and submit it to Shazam's severs, you're also grabbing frequencies: notes from instruments, unique harmonies and the like. Other people may be talking, your car's heating or A/C may be running, but if those notes and tones can come through, they should (in theory) still match up with certain combinations of frequencies found in Shazam's database. 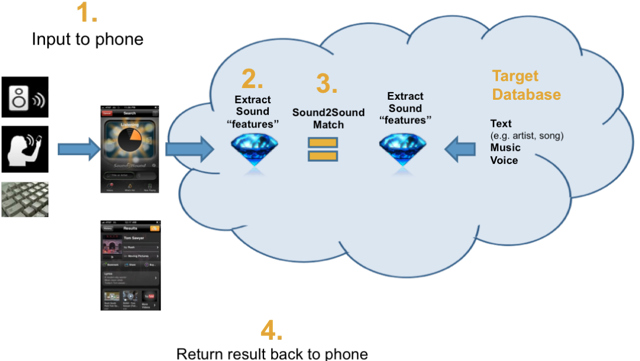 SoundHound's explanation is a bit more vague, and the backing technology, Sound2Sound, also allows for humming or singing tunes for identification through Query by humming (QbH). The official about page suggests a system likely similar in outline to Shazam's, but with perhaps different unique features being searched out. "S2S performs recognition by extracting features from the input signal and converting them to a compact and flexible Crystal representation. This Input Crystal is then matched against a database of Target Crystals which have been derived from searchable content." Get your singing, humming or tapping chops ready, and you can try out QbH at Musipedia. In the meantime, let's give Shazam and SoundHound some real-world tests. The realest of real-world app use we can imagine is actually a time when, all things considered, it would be better not to be using either one of these apps. So, by all means, hand over your phone to a passenger, or pull over to give your phone a few seconds alone with that song you're digging. But if you must click the big button on Shazam or SoundHound, and hold it just under the steering wheel while you drive, here's how they would perform. For these tests, I loaded a CD, while driving with the heat set to its highest fan level, and activated each app at the same point in each song. Shazam: Nailed on the first try. SoundHound: Wrong pick on the first try — "Ghost of Love" by Rasmus. Second try successful. The Beatles: "You Never Give Me Your Money"
Shazam: Data/upload errors halted app three times; correct on fourth try. SoundHound: Right on first try. Shazam: Could not identify in three tries. SoundHound: Right on first try. In a small, small office, one worker controls the Pandora mix for everyone's soundtrack. I used my Nexus One to try and tag a few songs, then verified them with the station creator. People may have been quietly talking during some attempts, but not close to either the phone or the speakers. Justice: "Newjack" Shazam: Third try. SoundHound: First try. Passion Pit: "Sleepyhead" Shazam: First try. SoundHound: First try. Shazam: Second try. SoundHound: First try. A very willing friend kept an awkward patter going, while I started at 3m, than 1.5m, then putting her iPhone (3G) right next to the speaker, to see how close I'd need to be if people were actively talking during a song. The Social Network Soundtrack, "Hand Covers Bruise" Shazam: Picked up when next to speakers. SoundHound: Never got it. Sufjan Stevens, "Too Much (Short Version)"
Shazam: Never got it. SoundHound: Picked up next to speakers. Big Star, "Back of a Car" Shazam: Second try (about 1.5m). SoundHound: Second try (about 1.5m). When it comes to the ideal conditions for identifying a song, it would seem a few rules stand out. For one thing, get your phone as close to the music source as possible. On another point, noise is better dealt with than conversation, so, well, shut your trap if you'd really like to know the artist and track. I've used both apps outside these "official" tests, too, and I've come to think of Shazam as better with "popular" music, whereas SoundHound seems to have deep roots in jazz and other older, wider catalogues. That said, neither app was all that great with tracks that featured distortion, ambience and electronic effects — the more clear the melody, and crisp the singer's voice, the better shot the app seems to have at it, which jibes with the underlying frequency-charting technology. Given one choice, I'd go with SoundHound, as it seems dedicated to being free to use in the long term, glitched out less (though perhaps this is an Android-specific problem for Shazam), and picked up more songs that Shazam had no idea about. Shazam, on the other hand, seemed like a great app for anyone with tastes running toward pop music. I thought I'd read somewhere about Shazam's technology used as a part of YouTube's copyrighted material identification program, but I can't find a relevant link at the moment. Done your own side-by-side tests with Shazam, SoundHound or other song ID clients? Tell us which one you'd use in your car or favourite loud spot in the comments. I used shazam for a little while, but recently switched to soundhound as I was sick of shazam constantly crashing - iPhone user. Another rule: I listen to a lot of DJ mixed music. It's worth noting that if the mustic is playing at a different tempo (as is often the case), Shazam won't find the track. As such, finding the names of tracks in DJ mixes is particularly difficult. I've also had false positives from DJ mixes. Occasionally I have had some luck with Shazam in a nightclub environment - most the time it picks the wrong thing though. Yeah the problem is you're using it in a nightclub. It's only designed to identify MUSIC. I wish to make two observations. 1. I downloaded SoundHound after briefly reviewing a number of feedbacks and reviews on various sites, with SoundHound seeming to have the less problems and more favourable reviews. 2. I would have thought that current popular songs would be replayed on various radio stations at more regular intervals, and so would be generally easier to identify the songs by dj's and peers etc, whereas an older song may be just played the once, with no more opportunity to find what the song is, hence SoundBooth was my choice. Soundhound can almost never recognize any classical music, unfortunately. soundhound is way better... u can hum songs and it gets them! Thank you for this post. Exactly what I was looking for. And I definitely agree. My personal opinion? Each has a free version, so why not have them both? Most important thing for me with these apps is accuracy. I am not sure if I agree with the Shazam is better with popular music and SoundHound with "deeper roots." In my own versus battle, I found Shazam correctly identified a demo version of Slow Show by The National (and the EP it came from) while SH couldn't do it at all even though it got another song from the same EP. But then Shazam could not recognize Feb. by On!Air!Library! but SH got it right away. So I've decided that I'll keep both. If one can't get it, the other might. "shut your trap if you’d really like to know the artist and track." Funny. I personally use soundhound more, it's free and better with salsa music. I have both on an iPhone 4, and use both. I can't say one is consistently better than the other. I tend towards piano or acoustic guitar music, if one clearly doesn't get the piece it hears or makes a mistake, I'll try the other. With both, you're almost sure to get the name. As one commenter said, they're both free, just have both apps. Sorry dudes, Shazaam, is much better. Don't agree. Before choosing which application to use, i read this article. After reading this, Sound Hound sounded like a much better application then Shazaam for music finding. But being always skeptical, I decided to try by myself. Well, Shazaam had 85% more success rate then SoundHound. But sometimes, there are songs that Shazaam can't discover, while sound hound can. If you want just one app for music finding, Shazaam is the best. But if you don't mind the extra space, keep all your music trackers. That's weird, because I find soundhound(android) much better and with more useful features. I found shazam too mainstream or hard to hard to detect songs. But I respect your opinion. I perfer SoundHound for the looks of the program, so I always try it first. I've noticed that with new single releases, soundhound hardly gets it, they need to be a little older for it to get them. I found this strange as I am in Australia, and songs are already delayed by the time they get here. So SoundHound (in my expierence) takes longer to update their database with new music, but is better overall as a majority. I do have Shazaam though but only as a backup. I used to be a Soundhound user, and my friend is a Shazam user. I say "used to be" because I deleted it after realizing he was picking up underground, and multiple-genre songs from Shazam while my Soundhound app couldn't find the songs on multiple tries. Shazam is what's up! Y'all are missing the best part about Soundhound - the endless entertainment that can be had by humming tunes into the app, then listening to other people's renditions of the song you hummed. Totally entertaining, and you can end up singing duets with people from all parts of the globe. Soundhound. Recorded less than 5 seconds of the END of "Grand Tourino" and it nailed it, first try. Soundhound by a landslide. Almost never fails, and unlimited tags. I LOVE Soundhound. It can even identify Spanish Worship songs. Sometimes, though, it got the song right but when I played a different version, gave me the same album info. It is great. I cranked through probably 25 untitled tracks in about 35 minutes and manually added the info to iTunes. Great. i prefer to use soundhound tho :) it gets almost all my fav songs right. I downloaded and tried both and while they're both pretty nifty, I happen to prefer Soundhound. It identifies the songs faster, is slightly better at id'ing them, and the ads are very unobtrusive compared to Shazam's (which weren't horrible mind you). In the end, it just comes down to personal experience and preference and in both departments, Soundhound won me over relatively quickly. The ability to hum a tune to soundhound is the feature I like. Can't do that with shazam. TrackID taps into the Gracenote database, which holds more music than Shazam and SoundHound. But if you want to maximise your chances of identifying a song, just record it with your phones voice recorder, and then feed the recording to TrackID/Shazam/SoundHound. This way you can try all three databases without risking that the song runs out before you're done identifying it.